Drinking Gamez: Beer Pong, developed by Appatheia LLC, is one of the best ways to practice your beer pong skills from anywhere with out the need of actual beer or a ping pong ball. When you first launch the app you will be able to star a single plater game, multi-player game, access the store, options and Game Center. The game has some pretty good music but it can get pretty repetitive at times, luckily you can shut it off in the options if you want to. When you decided to start a single player game you will be able to choose your difficulty from easy medium or hard. Once you begin the game you have the options to call your shot, do a bounce shot to try a make a comeback, take your shot or ask for a rerack. To shoot the ball simply flick quickly from the ball towards the cup you are aiming at. Pay attention to the rainbow that flashes after your shot, it’s used to show where the ball will land. This allows you to fine tune your skills so that you can make that perfect shot. You can even tilt your device left or right to glide the ball into the cup. When you make a shot you will earn coins that you can use in the store to buy power-ups to help destroy your competition, Overall I would have to say this game is very fun and addicting. As your opponent makes more shots, and you are drinking more beer, the screen starts to shot and makes the game a lot harder and requires more skill to make the shot.If you prefer not to have the dunk effects you can turn them off in the options menu when you pause the game. I would have to say the only annoying think would be the constant hiccuping sound that I hear. Dringing GameZ: Beer Pong” will soon become “Drinking GameZ: 3 in 1” as brand new Flip Cup and Quarters modes are added as their own standalone game modes. Perfect your skills in Beer Pong and soon you will be able to master Flip Cup and Quarters right along with it, what else could you hope for? 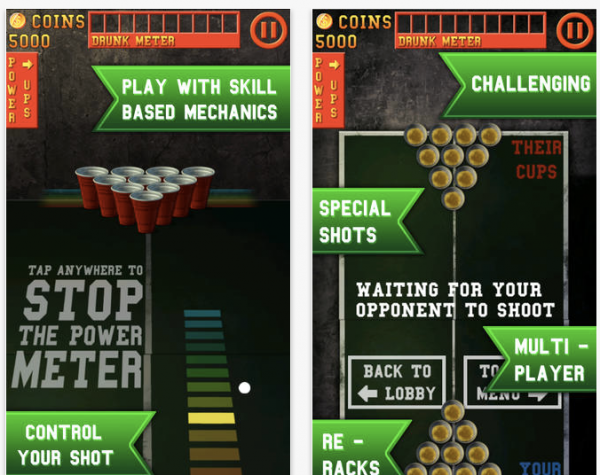 You can get Drinking GameZ: Beer Pong on the Apple App Store as a FREE download. it really is the most realistic and accurate representation of beer pong that you will find on your iPhone or iPod Touch.